Indie cinema with a restrictive license, newsletter and fundraising events. 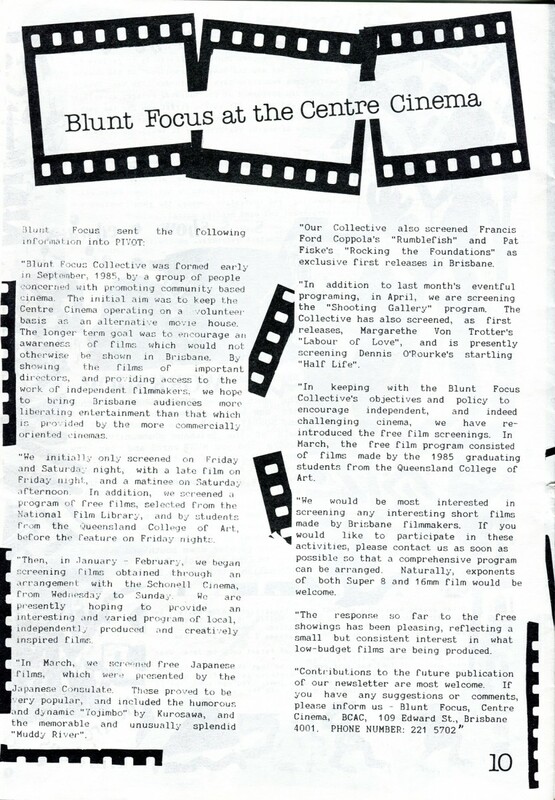 Blunt Focus Cinema Collective, Friends of Blunt Focus Film Group and audiences. Including artists and filmmakers Deb Beattie, Stephen Stockwell, Stephen MacKerras, Brian Doherty, Philippa Hall, Kerry O’Rourke, Amanda Faulkner, Sally Hart, Jane Richens, Michelle Andringa. Centre Cinema, 109 Edward Street, Brisbane.